There’s an old saying that “Fortune Favors the Bold.” It certainly has proven to be true so far for Alexander Treger and his fledgling Young Artists Symphony Orchestra (YASO), especially given their impressive inaugural concert a few weeks ago. To understand the full story, we have to go back to this past May. With Mr. Treger’s 17-year tenure as Music Director of the American Youth Symphony coming to a close, he hosted Ellen Whittier, a friend and neighbor living across the street, at his home for a drink. He shared with her and her husband, Ron, his idea of creating a new youth orchestra in Los Angeles and having their first performance be this fall, in Mahler’s daunting Second Symphony (“Resurrection”) no less. As audacious as this idea may have seemed to most people, the couple pledged their support. It’s always nice when your friends like your ideas, but the Whittiers aren’t your average neighbors. As philanthropists and founders of their own educational foundation, they were well positioned to turn Mr. Treger’s aspirations into musical reality. The plan became public on July 20th when a press release was sent out announcing the new orchestra whose primary intent is “to champion, train, mentor and inspire the next generation of outstanding young musicians for professional careers in classical music.” It ultimately came to fruition on October 11th when Mr. Treger and YASO, together with two soloists and the Angeles Chorale, took a shot at Mahler’s 2nd Symphony. The result was decidedly on target. In a purely objective sense, if one were to eschew any special qualifiers added or accommodations made for performers or circumstances, it was a solid performance with which many professional orchestras would have been satisfied. For a youth orchestra, it was impressive. For a youth orchestra that hadn’t existed mere months prior and had only a handful or two of practices together, it was awe-inspiring. The strings were uniformly excellent: warm in tone, consistent in blend, and accurate in intonation. The other sections were strong too. Some of the entrances and cut-offs to phrases could have been cleaner, and there was the occasional flub in the brass, but overall, the roughly 80-minute performance was devoid of any glaring miscues. Among the many solo turns, Eduardo Rios (Concertmaster) and Yasmina Spiegelberg (Principal Clarinet) stood out for their lovely phrasing and sound. Mezzo-soprano Niké St. Clair and soprano Amanda Achen made beautiful contributions of their own, and the Angeles Chorale capably added their talents to the final movement. Mr. Treger seemed to care most about propulsion rather than details or subtlety in his approach to the symphony. He pushed the tempi throughout the night; the few times he changed it up, he did so dramatically and as a result, somewhat awkwardly. His Mahler 2nd was an 18-wheeler barreling inexorably downhill despite an occasional stab at the brakes, and I longed for more twists and turns along the way. At the same time, he managed to keep Mahler’s thick orchestration from overwhelming the sound, allowing inner string voices and woodwinds to consistently be heard. He handled the dynamics in the final movement with skill, maximizing the impact of the combined vocal and orchestral forces. It was the best conducting I’ve ever heard from Mr. Treger. 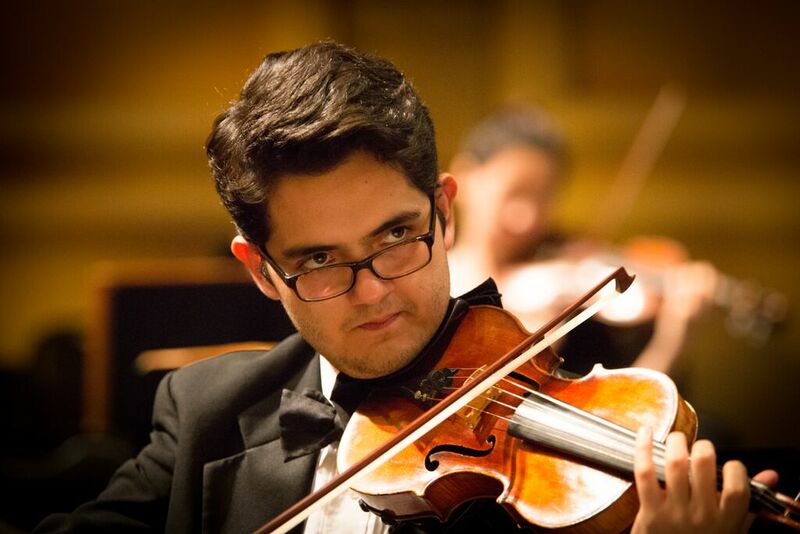 Mr. Rios, YASO’s concertmaster, occupies the “David Frisina Chair” in the orchestra, named for the legendary former Concertmaster of the Los Angeles Philharmonic. This is more than just a ceremonial or honorary title. The Gobetti violin and Nurnberger bow which belonged to Mr. Frisina is on loan from his family to the younger violinist. According to an announcement from the stage before the concert, this was the largest group of performers ever assembled on stage at Royce Hall. 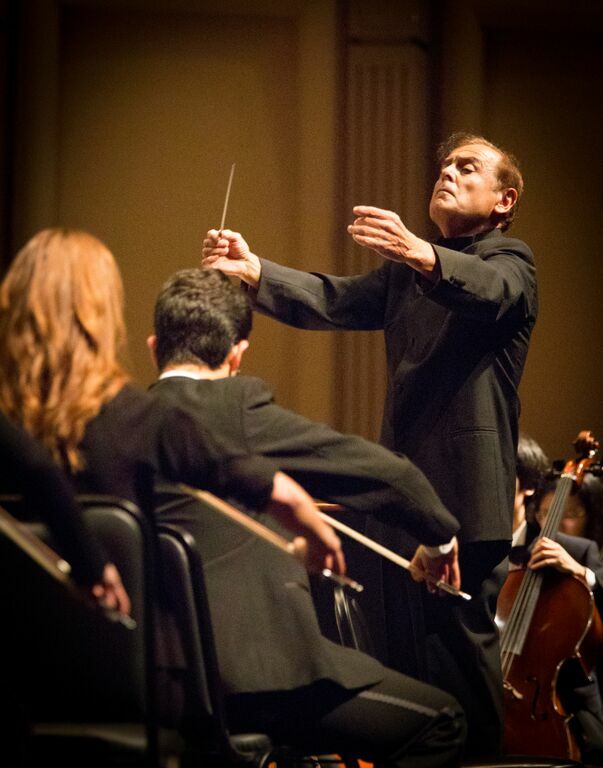 Does LA really need a new youth orchestra given the existence and long history of, say, Mr. Treger’s former band, the AYS or the Young Musician’s Foundation (YMF) Debut Orchestra? I don’t think it’s really a matter of needing a new orchestra; more music is always better than less, in my humble opinion, so I’ll happily take it. At the same time, it’s worth mentioning that a quick perusal of the roster of the three orchestras shows the overlap in musicians to be only 20% – 30% between YASO and either of the more established entities; I would have guessed it to be more, so clearly a broader sample of students are getting extra-curricular orchestral experience than they otherwise would have if YASO weren’t around. How is YACO going to be different than the other two youth orchestras? It’s not clear. As of right now, the most noticeable difference is in orchestral leadership: whereas the YMF Debut Orchestra appoints a young conductor to be Music Director every three years and the AYS has handed their podium to a serious of distinguished guest conductors for the 2015/16 season, YASO has an veteran musician in Mr. Treger running the show, and and as with any boss, his style of leadership may or may not be to every musician’s taste. Moreover, the AYS has been mixing up their standard classical music offerings with (gasp!) film music. I’ll be surprised if Mr. Treger makes that part of the programming with YASO. YASO’s next concert at Royce Hall will be on Sunday, December 6th. The program will include the Dvořák Symphony No. 7, Wagner’s Siegfried Idyll, and the ubiquitous Violin Concerto of Mendelssohn with Mr. Rios as the soloist. Tickets are free and will be available at the door, though reservations can be made in advance at YASOLA.org or (310) 905-3496. Tags: Alexander Treger, Amanda Achen, Angeles Chorale, David Frisina, Eduardo Rios, Mahler, Niké St. Clair, Yasmina Spiegelberg, Young Artists Symphony Orchestra. Bookmark the permalink.